The awesome Amy King announced she was open for commissions a few weeks ago, and I jumped right into the line. 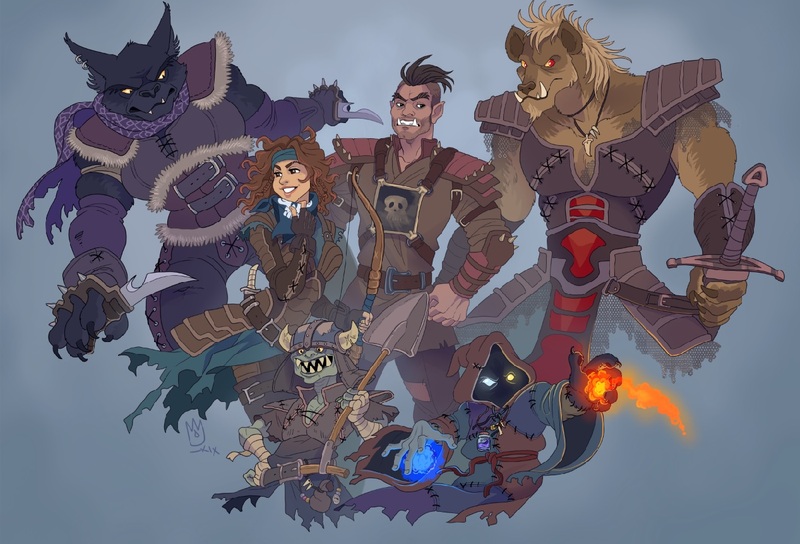 I wanted a group illustration of the crew from Wandering Monsters, and wow did she nail it! Do yourself a favor and go give Amy King’s Website a look, and if you’re on Twitter, follow her @sephiramy! Quick book update: Wandering Monsters 2 is still in the works. The paperback for Run Like Hell is slowly happening–I’m still learning to navigate a new system there. Good Intentions IV is also coming along; I think I’m maybe halfway through the rough! More clean fun please…well something different then harem litrpg. Love your work. Any news on the sixth book for Tanner Malone? Gonna be a while. I’m not working on one yet, so I don’t imagine we’ll see it this year. Have you considered wrapping up either story? Not that I’m necessarily in favor of that, just curious about long term prospects for both stories, if any? Or if you had an idea at this point how how to end either one? As always, thanks for the great reads. I’m always looking forward to the next book by you. The latest was actually fantastic, just wish it was longer.